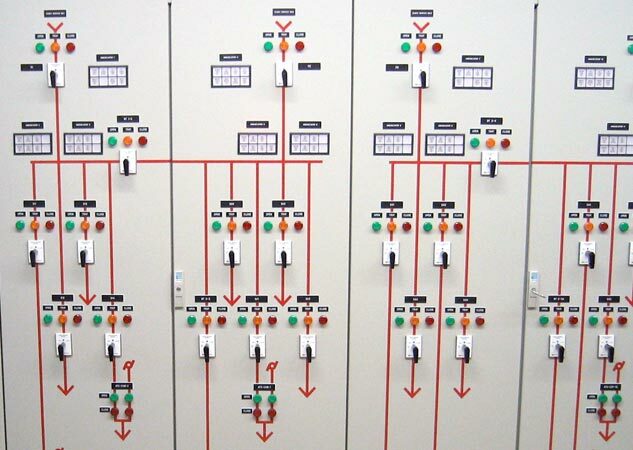 Risks such as confusing instrument transformers for metering and protection, or mixing up connections can be reduced significantly by testing before initial use. At the same time, electrical changes in a CT, caused for example by aging insulation, can be identified at an early stage. CT ratio is described as the ratio of primary current input to secondary current output at full load. For example, a CT with a ratio of 300:5 will produce 5 amps of secondary current when 300 amps flow through the primary. If the primary current changes, the secondary current output will change accordingly. For example, if 150 amps flow through a 300 amp rated primary the secondary current output will be 2.5 amps. Unlike the voltage or power transformer, the current transformer consists of only one or very few turns as its primary winding. This primary winding can be of either a single flat turn, a coil of heavy duty wire wrapped around the core or just a conductor or bus bar placed through a central hole. 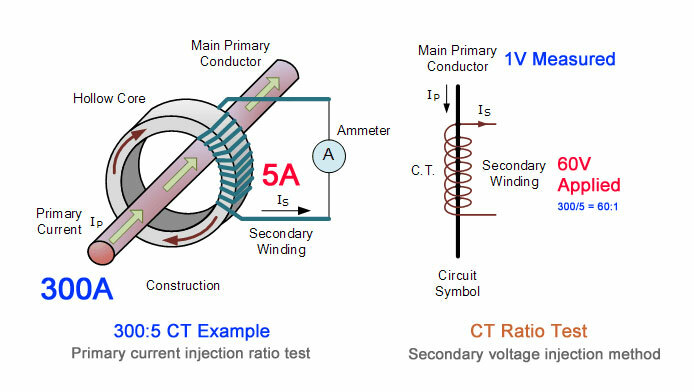 A CT ratio test can be performed by injecting a primary current and measuring the current output, or by injecting a secondary voltage and measuring the induced primary voltage. Photo: TestGuy. 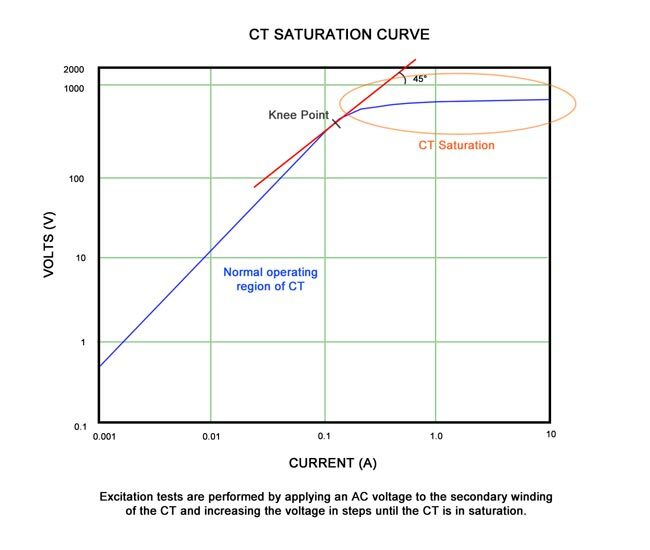 Ratio tests are performed by applying a suitable voltage (below saturation) to the secondary of the CT under test while the primary side voltage is measured to calculate the turns ratio from the expression above. DANGER: Use caution when conducting a CT ratio test and do NOT apply a voltage high enough that would cause the transformer to saturate. Applying a saturation voltage will result in readings that won't be accurate. A CT under test is assumed to have correct polarity if instantaneous current direction for primary and secondary current is opposite to each other. Photo: TestGuy. The polarity marks on a CT designate the relative instantaneous directions of the currents. 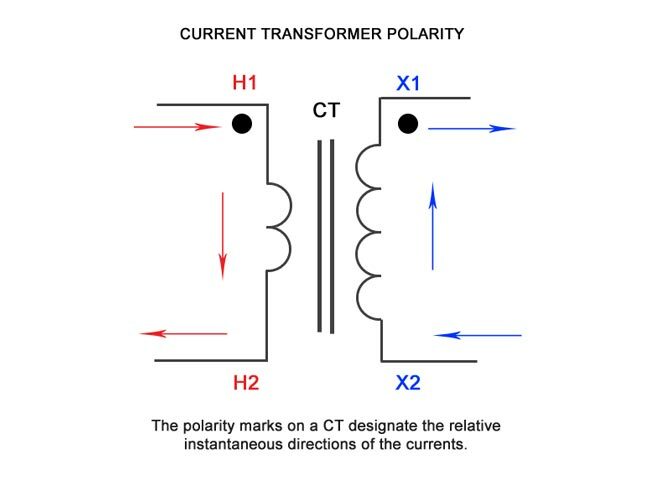 The polarity test proves that the predicted direction of secondary CT current (leaving) is correct for a given direction of primary current (entering). 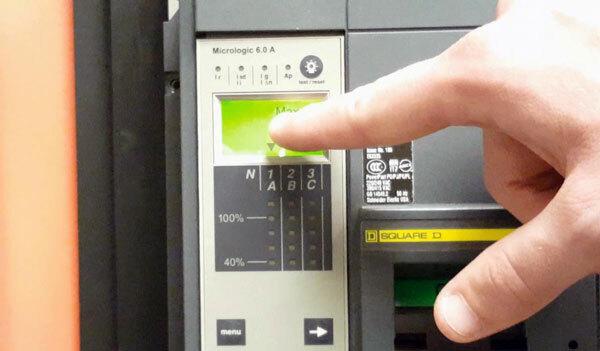 Taking care to observe proper polarity is important when installing and connecting current transformer to power metering and protective relays. At the same instant of time, that the primary current is entering the primary terminal the corresponding secondary current should be leaving the similarly marked secondary terminal. A CT under test is assumed to have correct polarity if instantaneous current direction for primary and secondary current is opposite to each other. CT Polarity is critical when CT's are being used together in single-phase or three-phase applications. 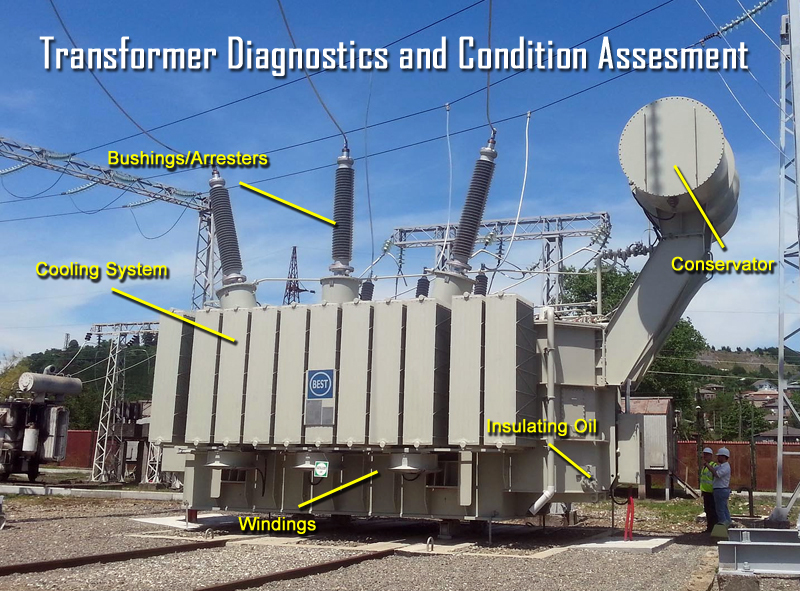 Markings on current transformers have been occasionally misapplied by the factory. You can verify the polarity of a CT in the field with a 9V battery. Photo: TestGuy. Disconnect all power prior to testing and connect the analog voltmeter to the secondary terminal of the CT to be tested. The positive terminal of the meter is connected to terminal X1 of the CT while the negative terminal is connected to X2. Run a piece of wire through the high side of the CT window and shortly make contact with the positive end of the 9-volt battery to the H1 side (sometimes marked with a dot) and the negative end to the H2 side. It is important to avoid continuous contact, which will short circuit the battery. If polarity is correct, the momentary contact causes a small deflection in the analog meter in the positive direction. 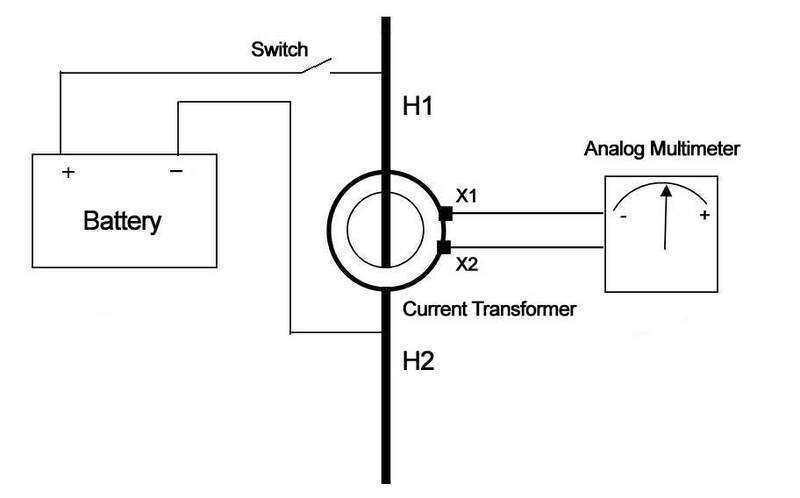 If the deflection is negative, the polarity of the current transformer is reversed. The terminals X1 and X2 need to be reversed and the test can be carried out. Note: Polarity is not important when connecting to ammeters and voltmeters. 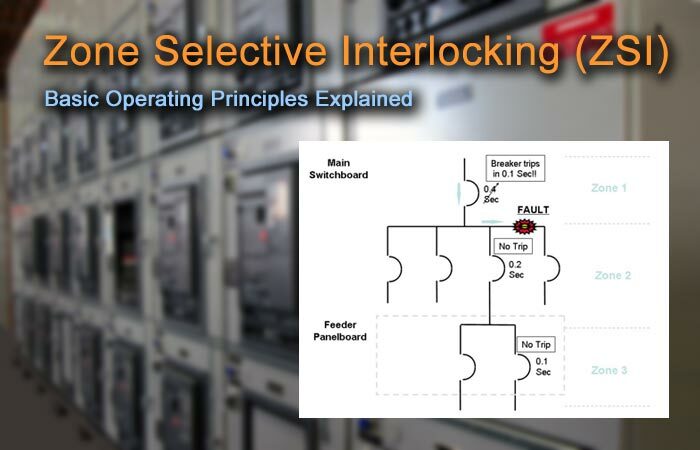 Polarity is important only when connecting to wattmeters, watt-hour meters, varmeters, and induction-type relays. To maintain polarity, the H1 side of the CT must be toward the source of power; then the X1 secondary terminal is the polarity connection. When a CT is "saturated", the magnetic path inside the CT operates like a short circuit on the transmission line. Almost all of the energy supplied by the primary winding is shunted away from the secondary winding and is used create a magnetic field inside the CT.
Excitation tests are performed by applying an AC voltage to the secondary winding of the CT and increasing the voltage in steps until the CT is in saturation. The "Knee" point is determined by observing a small voltage increase causing a large increase in current. The test voltage is slowly decreased to zero to de‐magnetize the CT. The test results are plotted on a logarithmic (log‐log) graph and evaluated based on the transition period between normal operation and saturation. Excitation tests are performed by applying an AC voltage to the secondary winding of the CT and increasing the voltage in steps until the CT is in saturation. Photo: TestGuy. The excitation curve around the points where current jumps up for a small increase of voltage; is very important for comparison of curves with published curves or similar CT curves. The excitation test results should be compared with published manufacturer's data or previous recordings to determine any deviations from previously obtained curves. IEEE defines the saturation as "the point where the tangent is at 45 degrees to the secondary exciting amperes". Also known as "knee" point. This test verifies that the CT is of correct accuracy rating, has no shorted turns in the CT and no short circuits are present in the primary or secondary windings of the CT under test. Primary to secondary: Checks the condition of the insulation between high to low. Primary to ground: Checks the condition of the insulation between high to ground. Secondary to ground: Checks the condition of the insulation between low to ground. Insulation resistance readings should remain fairly constant over a period of time. A sharp dip in trending of insulation resistance values point towards insulation degradation and further investigation is required to diagnose the problem. 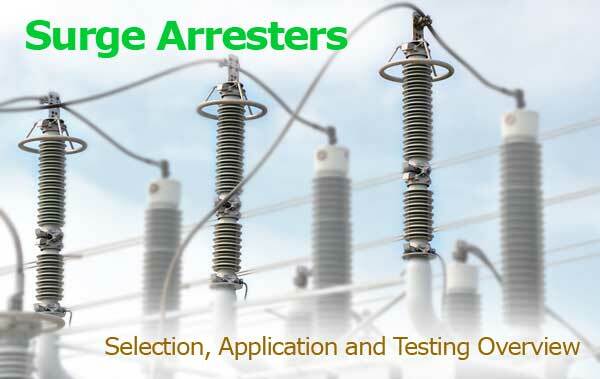 Insulation tests on current transformers are usually performed at 1000VDC. Prior to testing, short the primary winding of the CT under test by connecting H1 and H2, then short the secondary winding of the CT under test by connecting X1 and X2-X5. Remove the neutral ground and isolate the CT from any associated burden. After the windings are shorted, the CT will be a three terminal specimen. 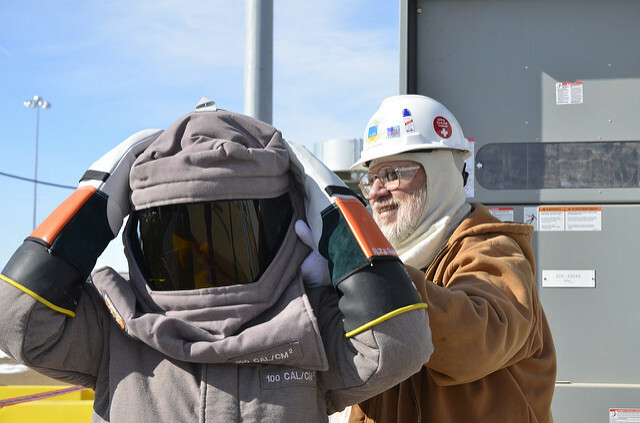 Three insulation resistance tests are performed to determine the condition of the insulation of the CT under test. Photo: TestGuy. 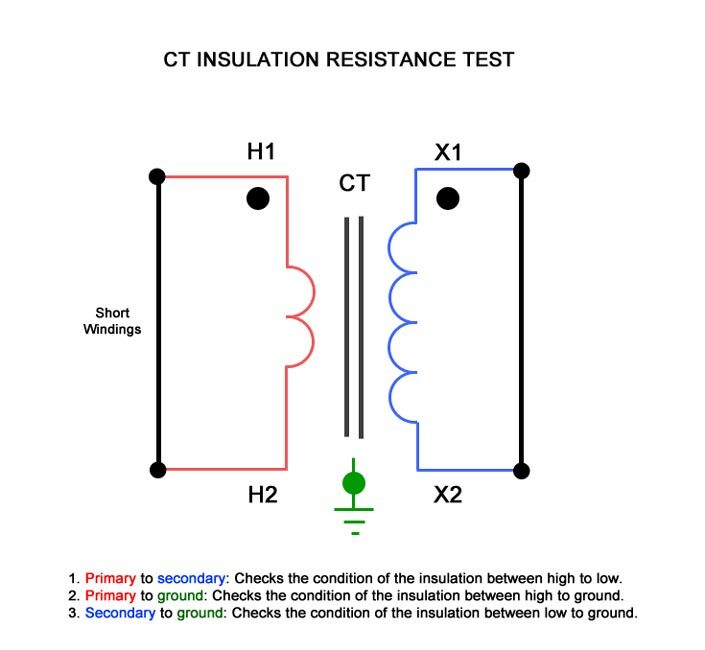 Insulation resistance test values for CT's should be compared with similar readings obtained with previous tests. Any large deviation in historical readings should call for further investigation. The minimum insulation resistance that is accepted is 1 Megohm. Any reading in Megohms is considered to be a good insulation, however, it's the trending of insulation test results that gives the true condition of CT insulation. Note: Insulation readings are greatly affected by the specimen temperature. Should a reading be compared to previously taken readings, proper correction factors need to be applied, if taken under different temperature conditions before drawing any conclusion. The DC winding resistance measurement is an important measurement in accessing the true condition, state and accuracy of a CT. Winding resistance in a CT will change over a period of time depending on the specimen age, use, external conditions and loading effect. It is recommended to measure DC winding resistance periodically on a single tap or multi tap CT and trend the values. A high precision low resistance measurement circuit is required to obtain this small winding resistance. 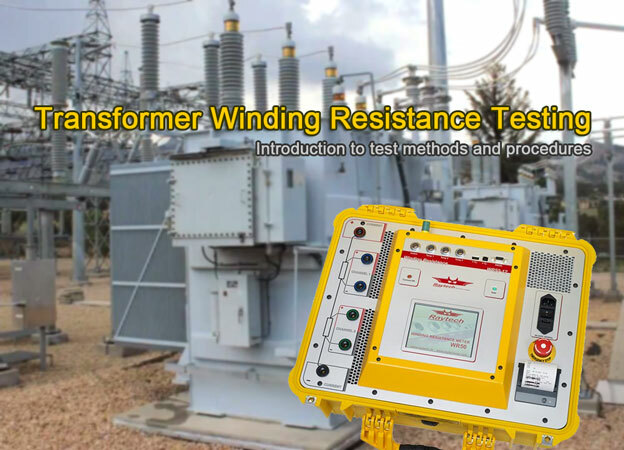 The winding resistance of a current transformer is found by dividing the voltage drop across the winding (measured from dc milli voltmeter) with the applied dc current through the winding. The CT should be demagnetized after the completion of winding resistance test. 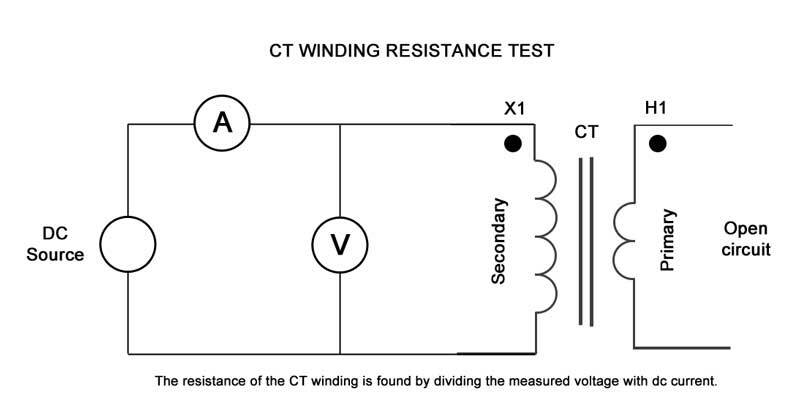 Measure CT winding resistance by passing a DC current through the winding and measure the voltage drop. Divide the measured voltage by the measured current. Photo: TestGuy. Tip: Run a saturation test to demagnetize the CT at the completion of all winding resistance tests. 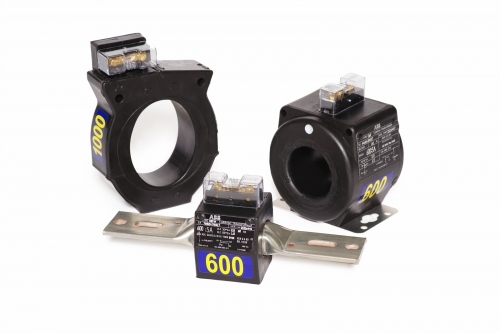 The burden of a current transformer can be defined as the total impedance in ohms on the secondary output terminals. 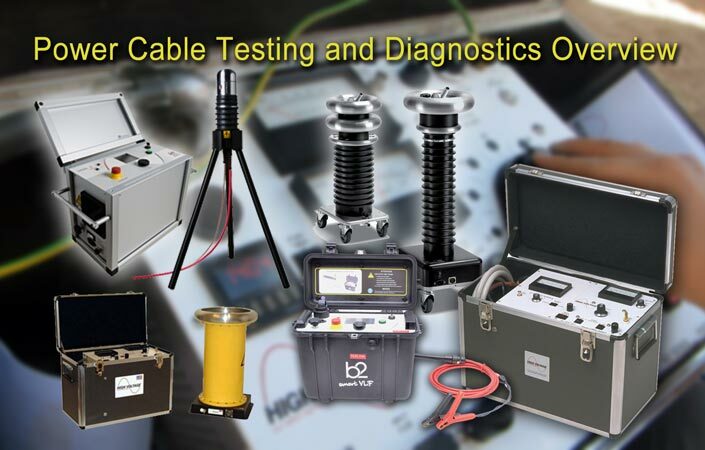 The total burden is a combination of impedance offered by watt-hour meter coils, relay current coils, contact resistance, terminal blocks, wire resistance and test switches used in the secondary loop. Each CT has a secondary burden when connected in a relay or metering circuit. 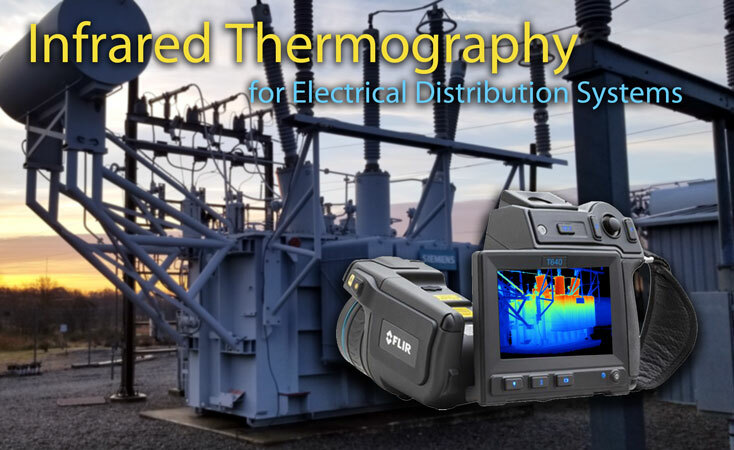 CT's are expected to provide the secondary output current based upon their accuracy class. If a current transformer is not properly sized based upon secondary loop burden, it may result in a decrease in CT secondary current. Burden testing is important to verify that CT is supplying current to a circuit that does not exceed its burden rating. Measure burden by injecting the rated secondary current of the CT from its terminals towards load side by isolating the CT secondary with all connected load, and observe the voltage drop across the injection points - and at every point of the circuit to ground. This method is time consuming, but only requires a voltage source, a resistance, and a voltmeter. Measuring the voltage drop at the source combined with ohms law will give us the burden impedance. Analyzing the voltage drop patterns throughout the circuit confirms the wiring is correct. Current transformer burdens are typically expressed in VA. The burden test is performed to verify that the CT is capable of supplying a known current into a known burden while maintaining its stated accuracy. 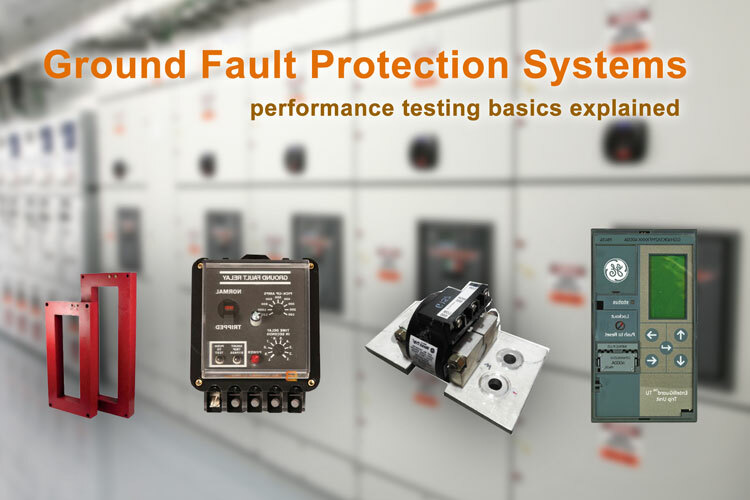 A burden test is typically performed at full rated secondary current value (ex. 5A or 1A). 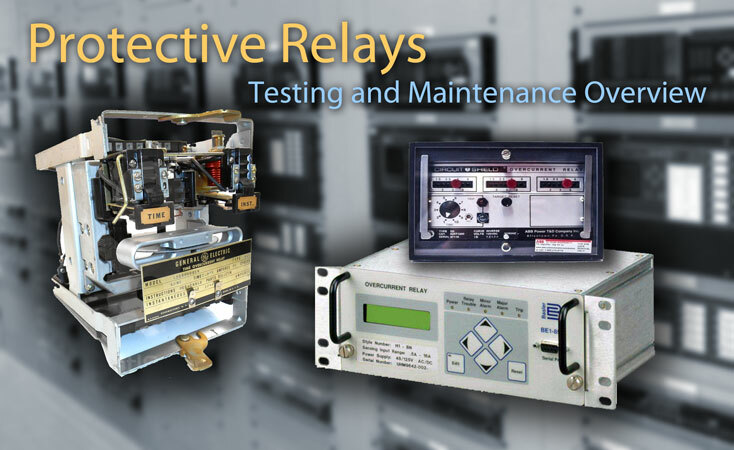 Depending on their accuracy class, CTs are divided into two groups: Metering and Protection (Relay). A CT can have burden ratings for both groups. The last number specifies the max. Secondary voltage at 20 times the rated secondary current without exceeding the 10 % ratio error. For a CT with secondary current rated at 5 A, 20 times rated current secondary current would give a burden of 4 ohms. Thanks for the excellent explanation of burden.